He’s More Than a Play Caller. Doomsday. The Monday after the last regular-season game in the NFL. Coaches dropping like flies! Do owners and GM’s just not care? “It’s business”, they say. But really it’s more than business to the players and coaches. I watched as my team lost Coach Pagano today. I watched Coach Del Rio, Coach Caldwell and Coach Fox be added to the unemployment list. Then I saw players interviewed and realized it’s not “just business” to those who don’t sit in the front office. And on and on. Players talked about how coaches were more than just play callers and helmet-patting sideline men. As Christians, we have one of those irreplaceable not-just-a-coach on our team. Jesus cares about what’s going on with your family. He leads you everyday as if you are still a rookie Christian. He not only helps lead your decisions in your everyday life, He is also your friend. It’s not just a game to these NFL coaches. It’s a big family; a group of believers, individuals, who need someone to listen and guide them on and off the field. And a lot of these football coaches do just that. Invite Jesus to be YOUR coach today and let Him guide you throughout every play of your life. 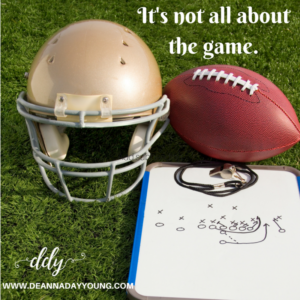 This entry was posted on January 2, 2018 with tags: #makeadifferencetosomeoneeveryday, #nflcoaches, christian, Jesus by Deanna Young. We start with not planning to eat sugar and planning to exercise 6 days a week. We plan to be a better spouse, parent and co-worker. We are going to declutter the house by spending 15 minutes each day getting rid of the unwanted and then being so organized we will always be able to find our latest tax return and the receipt for the sweater we bought our friend for Christmas. Then January 15th rolls around and we realize we had cookies this week, yelled at the kids, and snapped at a co-worker. The house is worse than it was before we made the resolution and the exercise equipment is still in the box. So we give up. Heck with it. Resolutions failed. Give up. Right? Wrong! What if we had a different plan? What if we set “goals” instead of “resolutions”? Goals we have all year to accomplish. Resolutions can make us feel like a failure if broken. But goals give us the opportunity to start over multiple times without feeling like we have failed or giving us an option to quit. This year I want to pray more, write more, speak to groups more about making a difference to someone every day. I want to read more books and read more of my Bible. I want to increase my exercise and keep going with my weight loss plan. I want to encourage people more and do more intentional acts of kindness. All of these things are great to put on paper but without a plan nothing will be accomplished. Take a few minutes today and write down what you hope to accomplish in 2018. Then think about how you want to accomplish those goals and make a plan. What is your biggest goal for 2018? I would love to hear about your goals so we can work together to make 2018 the best year yet! 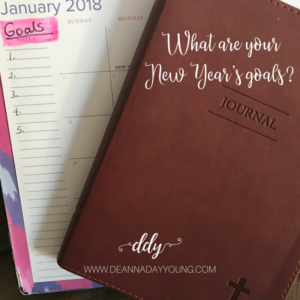 This entry was posted on December 31, 2017 with tags: #2018resolutions, #makeadifferenceeveryday, christian, goals by Deanna Young. How does a car know to send you a dashboard warning that driving conditions could be hazardous? Technology just amazes me. The sensors on my car knew that it was drizzling rain and that the temperature was close to 32 degrees. It knew that those two factors together should produce a warning message to let me know to be careful while driving because ice could be possible. Although I didn’t see any signs of ice, I was thankful for the warning to be cautious. There it is! Our conscience. The Holy Spirit. God’s leading. We do have it. I believe that deep down inside, our human technology processes when the environment, the conditions, the choices we have to make are hard and together with our right-versus-wrong temperature, our inner conscience gives us the warning. Keep your eyes wide open today, your heart on guard and don’t let the devil’s dangerous conditions steer you off course. 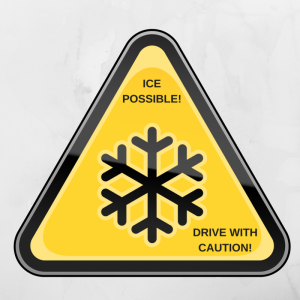 Drive with caution through your day and let God lead you safely through the icy patches. This entry was posted on October 30, 2017 with tags: #makeadifferenceeveryday, christ, christian, peace, prayer by Deanna Young. If You Could Live Anywhere In The World…. The question of the day: If you could live anywhere in the world, where would it be? Some people may choose a beautiful place they have visited such as Ireland or Australia. Other people may choose some place that they have always dreamed of visiting. Maybe a setting in a book they read or a place they saw on television. Some people may be very happy and content right where they are and would choose their current location. Me? I would choose Chick-Fil-A. Yes, you heard me right. Chick-Fil-A. I love so many things about that place. Just pulling in the parking lot makes me smile. They value their employees by being closed on Sundays and holidays to give people time to be with their families and worship if they choose. They stand up for Christian values. And they are still the 8th most successful fast food restaurant in America according to QSR Magazine. Why would I like to live at Chick-Fil-A you may ask? *They have awesome food and many healthy choices. Not to mention those awesome waffle fries! *I can get all the Sprite I want. *People are sooooo nice to me. *It is so clean and I wouldn’t have to run the sweeper myself. *I love the way they have decorated the place. *I get my own personal server who continues to tell me how much of a “pleasure” it is for him to serve me. *I love their taste in music. *I get my ketchup in those cute little containers that are shaped like a mini bottle of ketchup! *I get all of the extras in a cute little popcorn-box-shaped container to take to my table that has a number where they can find me instead of yelling out my name across the masses. *It’s very peaceful and I can hear myself talk but yet I never feel lonely because there are always people around. *They have the best indoor playground ever. *And they rest on Sundays. Yes, today if I could live anywhere in the world, I would choose Chick-Fil-A. 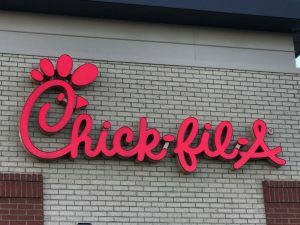 This entry was posted on September 8, 2017 with tags: #chicken, #chickfila, #makeadifferenceeveryday, #peaceful, christian, kindness by Deanna Young. Have you ever walked or driven by a group of workers and it appeared like only one of them was working while the others were just standing around talking, laughing, hands in their pockets? We may become aggravated and have thoughts cross through our minds like: “are they getting paid to just stand there?” Or we may have thoughts of them being lazy or not doing what they are hired to do. We may think they are goofing off and taking advantage of something or someone. Well what about you? What about me? Has God ever called us to do something and we just stand around and ignore Him? Do you feel God calling you right now to do something and you’re like one of the workers just standing around with your hands in your pockets watching someone else do His work? If you feel called to do something for the Lord, get on it! As Christians we are commanded to teach and preach God’s word to others. When we ignore our duties or our calling, we are just like one of those workers we get aggravated at who is standing around watching. Matthew 28:19 – Therefore go and make disciples of all nations, baptizing them in the name of the Father and of the Son and of the Holy Spirit, and teaching them to obey everything I have commanded you. And surely I am with you always, to the very end of the age. Are we one of those workers? Are we just standing around looking, hands in our pockets, talking and laughing? Or are we the one doing the work? Would God be aggravated at us if He drove by and saw us looking at all the work that needed to be done instead of getting our hands dirty and doing the work He called us to do? Work or Watch? What will you be doing today? This entry was posted on August 29, 2017 with tags: #makeadifferenceeveryday, christian by Deanna Young. While in the Everglades we took an airboat tour learning about plants and wildlife in the Everglades. Of course we were all on the lookout for alligators and fortunately we got to see several. We also got to see a bird native to the Everglades. Although I can’t remember the name of the bird, I remember that the momma bird was very protective of her babies. This entry was posted on August 6, 2014 with tags: christian, everglades, God's love, John 3:16, mother's instinct by Deanna Young. You don’t hold a grudge………a grudge holds you. (Borrowed from 93.3 Christian radio). Do you remember why you are mad at them? Don’t let that grudge keep a hold on you. Maybe it’s time. Put it down. Let it go. Forgive……….and be FREE! This entry was posted on July 5, 2014 with tags: bucket buddies, christian, forgive, God by Deanna Young. It’s true that there is a season for everything. As I look back over the years of being a new wife, a new mom, watching our kids first day of kindergarten, then first basketball games, softball games, celebrations of 13th birthdays, vacations, first love, then heartbreaks of first love, then death of loved ones, then college, more celebrations, more heartbreak, proud moments and disappointing moments, I see many changes in seasons. But through it all, I loved being a mom and a wife and celebrating life. I saw God in the trials and in the joy. I thanked Him for the good and begged Him for relief during the bad. It made me think about how I love every season in Indiana. I love the snow in the winter. I love the baby birds in the spring. I love the green grass in the summer. I love the beautiful leaves in the fall. No matter if it gets icy, rainy, hot or windy, I know I can make it through the few months to the next season and that I will love something about the next season that is coming. Keep this in mind as you are in certain seasons in your life. There is a reason for every season you go through in life. And there is a time for every season. It’s just a season. Cling to the Maker and you’ll get through it. Sun, snow, rain and wind are all good in their time. Enjoy the season you are in – “build a snowman”, “smell the flowers”, “dance in the rain”, “jump in the leaves”. There’s good in every season because God …….is………..good! 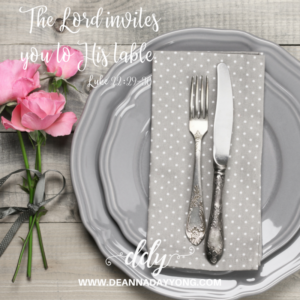 This entry was posted on July 2, 2014 with tags: bucket buddies, christian, God, God is in control, season, season for everything, there is a time by Deanna Young.